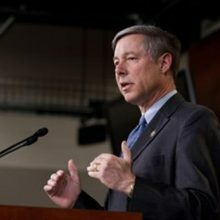 Congressman Fred Upton is proud to represent the common-sense values of Southwest Michigan’s Sixth Congressional District. A diverse section of the state that stretches from the shores of Lake Michigan, the Sixth District is home to key industries that range from agriculture to auto parts manufacturing to high-tech biomedical innovation centers. It includes all of Berrien, Cass, Kalamazoo, St. Joseph and Van Buren counties, and most of Allegan County. Prior to his election to Congress, Fred worked for President Ronald Reagan in the Office of Management and Budget (OMB). While at OMB, he learned from President Reagan’s example that it does not matter who gets the credit, as long as the job gets done. That has been Fred’s approach since he was first elected to Congress in 1986 and continues today. From 2010 to 2016, Fred was selected by his House colleagues to serve as Chairman of the Committee on Energy and Commerce. This pivotal committee has jurisdiction over matters concerning energy, healthcare, the environment, telecommunications, commerce, manufacturing, and trade, as well as oversight and investigations. Hard work and bipartisan success was a staple during Fred’s tenure as chairman of the committee. Under Fred’s leadership, the Committee passed 354 legislative measures through the House and saw 202 of those signed into law by the president. Fred currently serves as Chairman of the Subcommittee on Energy, which has jurisdiction over national energy policy. Fred’s top priorities remain job creation, economic growth, and working to help all residents of Southwest Michigan live longer, better lives. Fred has long been an advocate for a greater emphasis on biomedical research to improve the public health. In 2014, along with U.S. Rep. Diana DeGette, D-Colorado, Fred launched the 21st Century Cures initiative. This bipartisan effort aims to bring researchers, industry, and patients together to speed up the discovery, development, and delivery of life-saving cures. The pursuit of these 21st century cures also supports Southwest Michigan employers and jobs by ensuring the United States remains the world leader in medical innovation. Marking the culmination of a three-year journey, President Obama signed the 21st Century Cures Act into law on December 13, 2016. Fred’s leadership on Great Lakes issues has earned him a local and national reputation. As an active member of the Great Lakes Task Force, Fred has an extensive, bipartisan record working to protect our Great Lakes. A leader on keeping BP from dumping pollutants into Lake Michigan, Fred has also been a long-time leader in preventing Asian Carp and other invasive species from entering our waterways, and working on bipartisan legislation to keep harmful pollutants like synthetic plastic microbeads from getting into Lake Michigan. Fred has also fought for consistent funding for the critical Great Lakes Restoration Initiative (GLRI). Fred will continue to protect our treasured Great Lakes so that generations to come can enjoy their beauty. Fred has worked tirelessly to ensure Southwest Michigan remains a hub of commerce and innovation. Our local economy and jobs remain a top priority. From the Harbor Shores project in St. Joseph/Benton Harbor and working to ensure the St. Joseph Harbor remains dredged and operational, to the widening of I-94 and working with local leaders on the Kalamazoo River Superfund cleanup. Fred understands that when Southwest Michigan is connected and its residents empowered, it thrives. Fred, and his staff, works hard to ensure that Michigan service members, veterans, and their families receive the benefits they have earned through years of service. From improving health care for our veterans, to improving the disability benefit system or getting veterans back to work, and providing overdue service medals, Fred has a strong record of supporting our brave veterans and their families. Additionally, Fred has been working closely with the U.S. Department of Defense to get the Missile Defense Agency Project approved for the Fort Custer Training Center. Fred has led the effort to ensure seniors keep access to their physicians and low-income children keep their insurance coverage. In 2015, the president signed into law H.R. 2, the Medicare Access and CHIP Reauthorization Act, which permanently fixes the broken Medicare Sustainable Growth Rate, strengthens Medicare in the long-term, extends federal funding for community health centers, and extends the Children’s Health Insurance Program (CHIP) that covers approximately 100,000 children in Michigan. More recently, Fred supported the efforts to reauthorize CHIP funding for six years – the longest and most generous reauthorization in the programs history. This legislation was signed into law in January of 2017. Fred strongly supports an ‘All-of-the-Above’ energy strategy that focuses on American energy development, emerging clean energy technologies, and traditional energy. This focus keeps costs low for families and businesses and helps America become free from reliance on foreign oil. Fred is also fighting to bring a halt to costly federal rules and regulations that needlessly slow private-sector growth. Fred believes in ensuring that the federal government remains limited, transparent, and accountable to Southwest Michiganders. Fred, and his staff, remain ever-committed to helping residents of Southwest Michigan who run into snags dealing directly with the federal government. He maintains two constituent district offices, located in Benton Harbor/St. Joseph (269-982-1986) and Kalamazoo (269-385-0039) as well as Washington D.C. (202-225-3761), where dedicated caseworkers serve as intermediaries to help them navigate the system. Fred was born on April 23, 1953, and holds a bachelor’s degree in journalism from the University of Michigan. He and his wife, Amey, have two adult children.